Numerous technical applications in the energy and metallurgical industries demand a fundamental knowledge of the flow of slags. Besides temperature and composition, which determine the internal structure of an oxide melt, crystallization in the slag significantly influences its flow behavior. Therefore, not only the temperature-dependent viscosity of fully liquid oxide melts was determined using a rotational high-temperature viscometer but also isothermal viscosity measurements were conducted, in order to examine the rheological evolution over time caused by crystallization. The crystallization behavior during flow can be separated into three time regimes: a lag-time, in which the undercooled melt behaves as an Arrhenius liquid; the kinetic-driven crystallization; and, finally, the rheological equilibrium that is represented by a time-invariant viscosity plateau. To model the viscosity of oxide slags, in a first step, a self-consistent thermodynamic database for the system SiO2–Al2O3–CaO–MgO–FeO x –K2O–Na2O–P2O5–SO x has been established. The Gibbs energy of the liquid phase has been modeled using a non-ideal associate solution description. 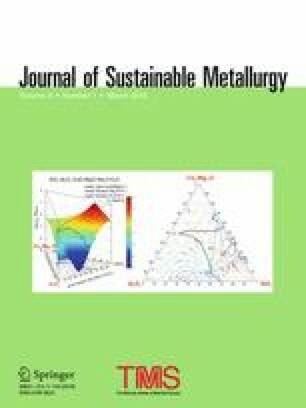 In a second step, an Arrhenius-type model for the calculation of viscosities of fully molten slags has been developed. The model is based on the same structural units, i.e., the associates, as the one for the Gibbs energy of the melt. In a third step, the influence of crystallization, which not only transforms the liquid into dispersion but also usually changes the composition of the residual liquid, on the viscosity is considered. The contributing editor for this article was Sharif Jahanshahi. The study described in this paper has been performed within the framework of the projects: HotVeGas, supported by the Federal Ministry for Economic Affairs and Energy (FKZ 0327773); and HVIGasTech, supported by the Helmholtz Association of German Research Centres (VH-VI-429).